Mixcloud Meetup London – The global community for audio culture. The Mixcloud team are very excited to announce our first Community Meetup in London. 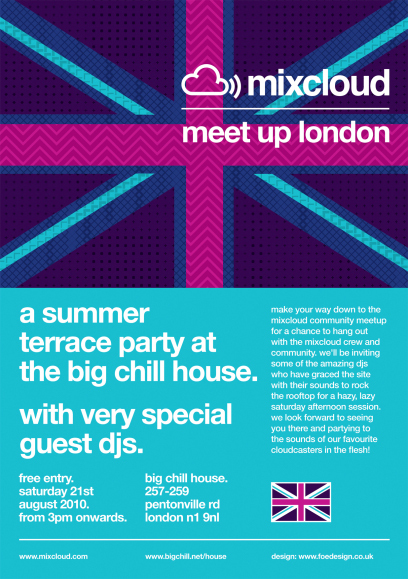 A Summer Terrace Party @ The Big Chill House – with very special guest DJs. Make your way down to the Mixcloud community meetup for a chance to hang out with the Mixcloud team and community. We’ll be inviting some of the amazing DJs who have graced the site with their sounds to rock the rooftop for a hazy, lazy Saturday afternoon session. We look forward to seeing you there and partying to our favourite Cloudcasters in the flesh! From 3pm onwards, free entry all day! Let us know if you are coming in the comments below or via our Facebook event page.